Jack-in-the-Pulpit is unusual and perfect for your shaded woodland garden. Late in the summer the flower is replaced by a seed head that turns red in the autumn. A must have! Arisaema triphyllum is a spring woodland wildflower that consists of the spadix (Jack) which is an erect spike containing numerous, tiny, green to purple flowers and the sheath-like spathe (pulpit) which encases the lower part of the spadix and then opens to form a hood extending over the top of the spadix. The outside of the spathe is usually green or purple and the inside is usually striped purple and greenish white, though considerable colour variations exist. The fleshy stalk and leaves lend an almost tropical aura to the plant. 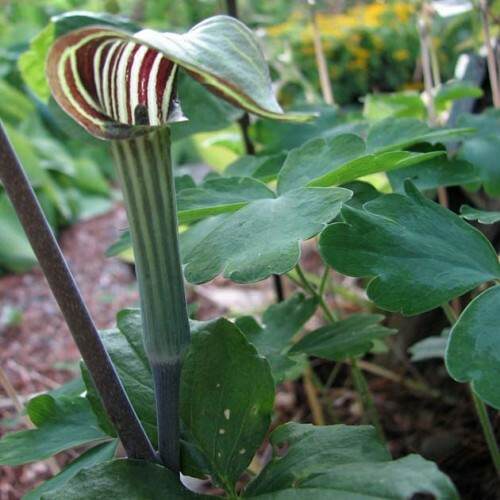 Flowering plants initially produce only male flowers, but become hermaphroditic as they further age (male flowers on upper part of spadix and female on lower part). Most plants in a colony will vanish by mid-summer (become dormant), but the mature, hermaphroditic flowering plant will produce a cluster of red berries in mid to late summer which becomes visible as the spathe withers. Jack-in-the-Pulpit is best grown in fertile, medium wet to wet soil in part shade to full shade.